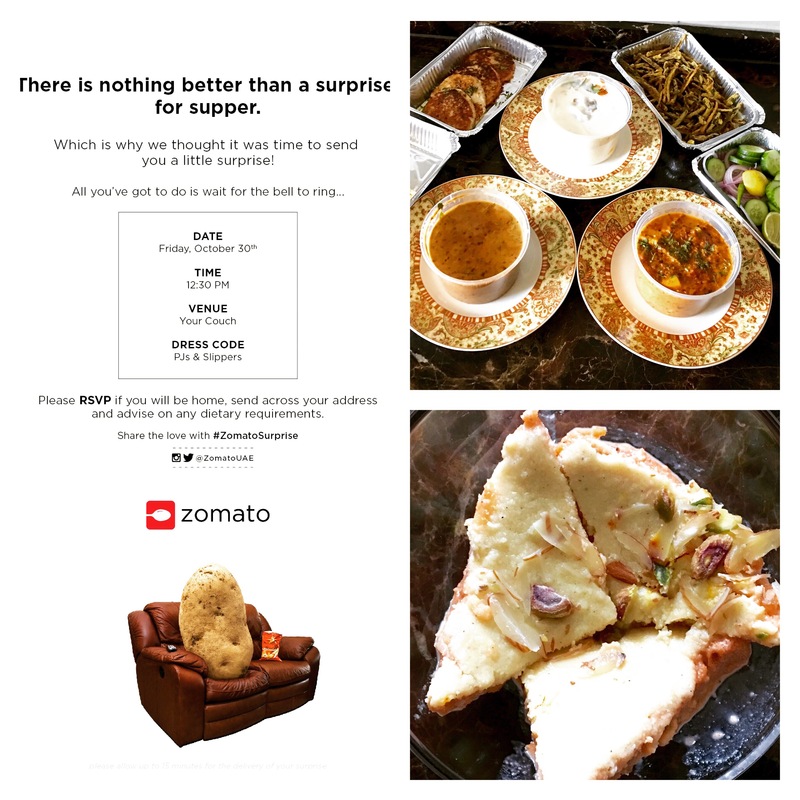 This was sometime around last week of October that I got a mail in my mailbox from Zomato. It said, there is nothing better than a surprise for supper, which is why they were sending me a little surprise and all that I had to do is wait for the bell to ring. Oh boy, that sure made my day. All I had to do was to put my feet up, relax and wait for the doorbell to ring. Yay, no cooking. This mail got the whole house excited, especially the kids. We had a competition for who will open the door first. At dot 12:30 in the noon, when the bell rang my 7 year old daughter was the first one to get to the door. 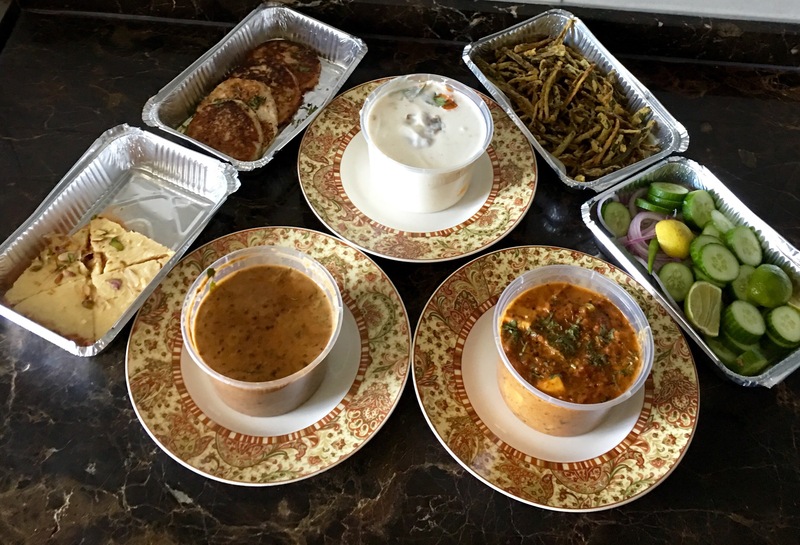 We had a delivery guy from Raaga restaurant in Karama at our doorstep. He had a big smile on his face and a huge bag in his hand. He told us the contents of the bag. Everything was vegetarian, as all of us are vegetarians. After bidding him goodbye, we immediately started off our lunch. The food from Raaga was hot and freshly made. They had sent us Dahi ke Shami Kebab, Bhindi Kurkuri, Dal Makhani, Kadai Paneer,mini bread basket, condiments like pickle, Papad, salad and Raita and Shahi Tukda. We put on our favorite show on TV and sat comfortably on our couch and started our lazy and relaxed Friday lunch. Before I tell you all about our meal, let me tell you a few things about Raaga. I have been to Raaga restaurant couple of times and I’ve also ordered food from them many times. Raaga is an Indian restaurant specializing in Awadhi cuisine. It is located opposite Burjuman Center, near Avenue Building in Karama. It is a small restaurant with nice interiors. They offer good variety for vegetarians and non vegetarians. The portion size is generous and the pricing is reasonable. We started off with the starters Dahi ke Shami Kebab and Bindi Kurkuri. Dahi ke Shami Kebab is one of the most popular and traditional kebabs of Awadh. This rich, soft and creamy Kebab is made with yogurt, paneer, chopped onions, ginger, coriander and spices. It was extremely delicious and just melts in the mouth. I certainly want to recommend this kebab. Bhindi Kurkuri is crispy fried okra. It was crispy, light and crunchy. Dal Makhani was perfectly cooked. It was heavy, creamy and tasty. Kadai paneer is paneer,veggies and spices cooked in a Kadai. It has gravy. It was too spicy for our taste buds. Mini bread basket had Tandoori Roti, Naan and Lachhedaar Paratha. They were freshly made and went well with the curries. Shahi Tukda is a simple dessert and quite easy to make at home. It is the Indian version of bread pudding made with bread and milk and garnished with nuts. It was sweet, soft and tasty. We enjoyed our meal from Raaga. It was tasty, authentic and delicious. They also do home delivery and catering. Friday afternoon couldn’t have got better than this. P.S- Now you can order online through Zomato! Next Is Everyone Hanging Out Without Me?